It's a siege! 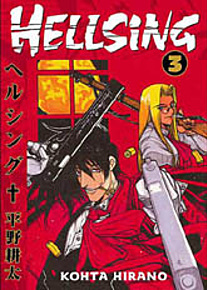 What's left of the Hellsing crew and their new team of hired bodyguards have traveled to South America to investigate the Millennium threat. While they crossed the border, parties unknown pulled some strings branding them as terrorists and matching a small country's power structure against the ultimate undead! Join them in a battle of blood, guts, ghouls, gore ... and a lot of Kohta Hirano's signature offbeat comedy. This punk-goth-vampire-action-comedy-fun-as-hell nightmare just keeps rolling, as Kohta has even more fun than he probably ought to. This series has enough style and strangeness to fuel ferociously fervent fandom.